One of the best kept secrets in the South Bay is the neighborhood of Hollyglen, a small pocket of Hawthorne just west of the 405 freeway. The neighborhood has it’s own award-winning school district and has a friendly and quiet feel that rivals the Torrance neighborhoods of Southwood and West Torrance. The biggest challenge for buyers over the past few months has been the lack of inventory and quickly rising prices. That may be changing, however, with a significant increase in the available homes. At the moment there are 7 single family homes available in the Hollyglen and Del Aire areas (all west of the 405 which has significant value differences from the area east of the 405) and a whopping 17 homes currently in escrow. This in a market that has recently seen only a trickle of available homes. Below are the current listings as of May 7th 2013. For the most up to date list visit our Hollyglen real estate site. Pending single family home sales. 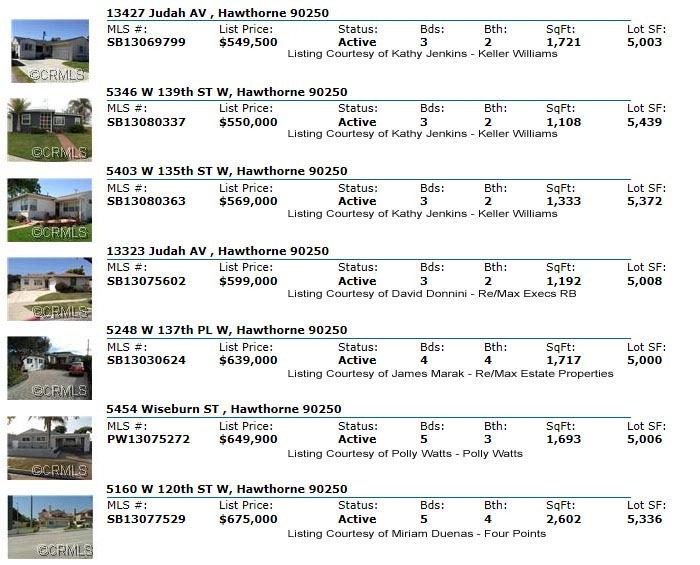 Current Hollyglen and Del Aire Home Listings on the MLS.